I wanted to try the Swiss Flyers out with a Dutch person who has been riding a regular bike all her life, so invited Christel Ankersmit along as a guinea pig. 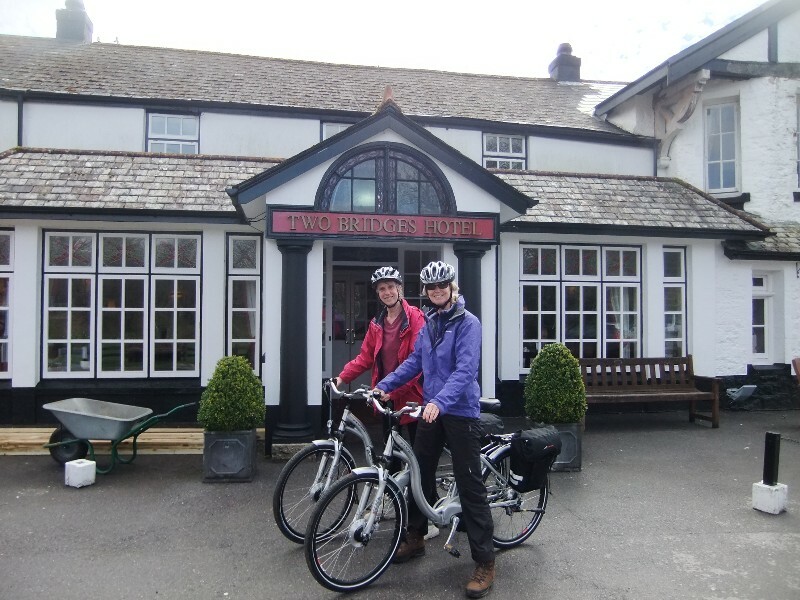 We took advantage of the warm spring sunshine yesterday to test-ride a new e-bike route starting and finishing at the Two Bridges Hotel – a great place to begin a ride as you’re already right in the heart of the moor. 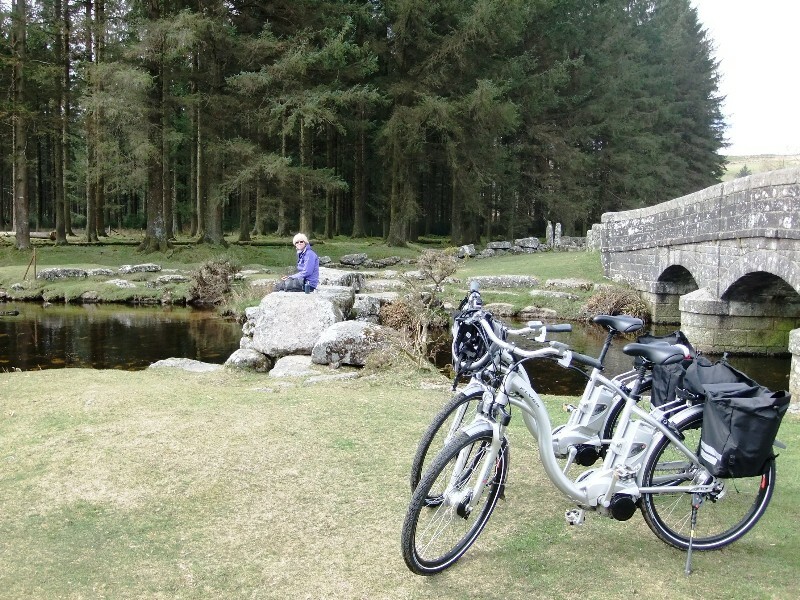 The first leg of the journey took us along the undulating road towards Postbridge, a stretch which has some of the most spectacular views over high Dartmoor – and they look even more spectacular from a bike than through a car window. To the right is Bellever Tor, to the left Longaford Tor and the high north moor. We passed Powder Mills, previously a site for the manufacture of gunpowder used in the many mines scattered all around this area - you can still see the ruined chimney and other ruined buildings. The road descends towards Postbridge with Bellever Forest appearing on the right. This is a good spot to walk/cycle into the forest to visit some very fine Bronze Age remains (stone rows, cairn circles and a burial kist). From here we sailed down the hill to Bellever Bridge and had a rest and snack sitting in the sun on the old clapper, watching a grey wagtail at work in the river. After Bellever, the lane is relatively little used as it winds across Cator Common. We stopped at the next bridge at Riddon Brake to admire the stream, and I heard my first cuckoo of the year. 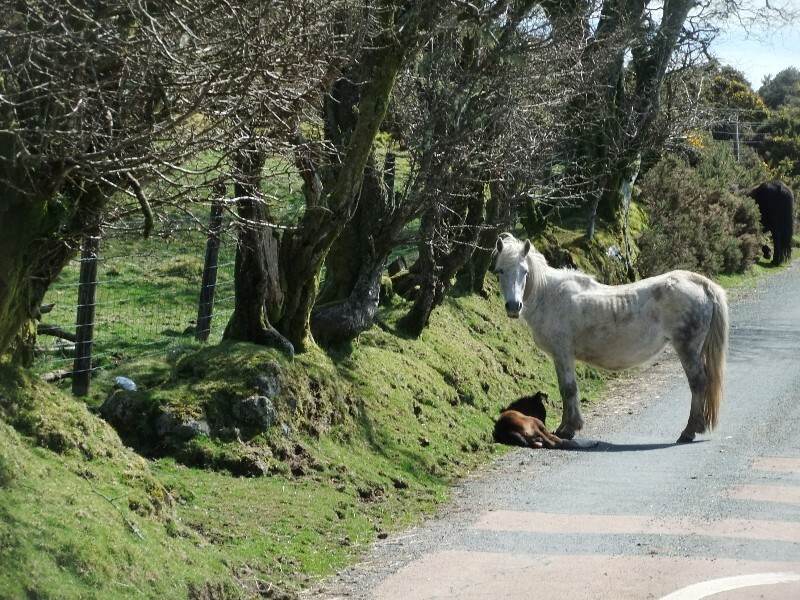 One minute later, we encountered a newborn foal and mother by the side of the lane. Spring has really arrived, even on high Dartmoor. A short distance further on, the lane was occupied by a large herd of Belted Galloway cattle. We ended up herding them some distance before they realised there was room for us to pass on one side – clearly they’re not used to much traffic. The lane then runs alongside Corndon Tor with great views over the West Webburn valley to the looming heights of Hameldown – classic Dartmoor scenery. A gentle climb brought us out above Dartmeet, just opposite Sharp Tor - a place to park the bikes and walk out to see the lovely Dart Valley from above, before the glorious descent to Dartmeet. It’s worth going slowly on the hill to take in the ever-changing views as the road winds its way across Yartor Down. On a full-day tour, we might lock the bikes up here and walk downstream along the river to find a good picnic and rest spot, before climbing out of the valley (much less steep in this direction!) and starting the return leg which runs alongside the West Dart. A couple more miles along the road is Dunnabridge Pound and the historic Judge’s Chair. 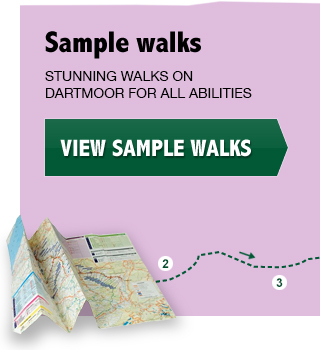 From here one can walk north to Laughter Tor stone row and – for the energetic – include an ascent of Bellever Tor for a real panoramic Dartmoor experience. 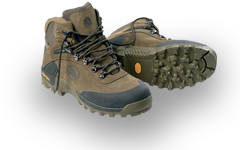 Or, for those that value their solitude, there’s a great riverside picnic spot about a mile away. At this point, it’s only another couple of miles back to the hotel – and it’s pretty much flat all the way.